Main Specifications : used as brightener for nickel plating, antiseptic, inhibitor and so on. Uses : used as brightener for nickel plating, antiseptic, inhibitor and so on. Product description: 2-Butyne-1,4-diol -BOZ(CAS No.110-65-6) 1.Synonym: BOZ 2.MF: C4H6O2 3.Appearance: Colorless to yellowish crystal 4.Assay: 98% 5.Melting point: 58°C 6.Boiling point: 238°C 7.Refractive Index(20°C): 1.4804 8. 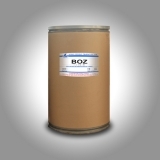 Application: Used in the production of Vitamin B6, butanediol and its downstream products. And it also can be used as brightener for nickel plating, antiseptic, inhibitor and so on.